Elie Daniel (right), tries to block City's Christopher Edwards. Kyle Griffin knew long ago that all-star games are a different breed of basketball animal. Confirmation, yet again, came yesterday. Three seconds remained at Saint Joseph's University in the 20th annual All-Star Labor Classic, which benefits United Cerebral Palsy of Philadelphia & Vicinity and is sponsored by organized labor, and members of the opposing team were making strange requests of Griffin. "Throw the ball away, so this can get into overtime and we can play some more," they were saying. Griffin politely ignored them. From the baseline, against pressure, he whipped a long inbounds pass to the opposite end of the gym. Khalif Foster (Academy of the New Church) made the in-stride catch, then deposited a layup at 0:01, and Suburbs owned a 120-116 win over City. Griffin was right near City's bench. He moved along in front of pretty much every guy, exchanging hand slaps and hearing repeatedly, "Good pass, Kyle." "All-star games aren't real basketball," he said, laughing. The 6-3 Griffin, a La Salle signee, is a senior at Germantown Academy. For Daily News purposes, GA is a city school. But while the Labor folks assign players from all Catholic League schools to the City squad, they divide the Inter-Ac by geography and that placed Griffin with the hicks or the guys from the sticks or whatever you want to playfully call them. "I know the city guys weren't going to try to lose to some suburban kids," Griffin said. He paused, then added with a twinkle, "Kids that they probably don't respect as much as I think we deserve. "Everybody was joking around beforehand. But once we started, you knew it was going to come down to business. I'm really happy we were able to pull it out." While zoomin' and high-flyin' were rampant - witness that the total distance of seven field goals scored by Imhotep Charter forward Kashief Edwards (Niagara) was zero feet (dunks only) - Griffin altered his game very little. He scored 11 points while shooting 4-for-9 (one trey) and 2-for-4, and added three apiece of rebounds and assists along with a block and a steal. "I did what I do," he said. "I'm not a great all-star-game player [from the entertainment standpoint]. I'm not the one dunking. Not the one throwing alley-oops. I just tried to get us the win. To get it done." Anthony Minor (Plymouth-Whitemarsh) led Suburbs with 20 points and 14 rebounds while Temple-bound Lavoy Allen (Pennsbury) claimed 13 boards. In City scoring, K. Edwards was exceeded only by North Catholic's Chris Edwards (7-for-12, 16; no relation) while K. Edwards (seven rebounds) and Franklin Learning Center's Malcolm Eleby (five assists) were the leaders in other categories. Griffin, of course, got some numbers and the most enjoyable letter - W.
"It's great to end your high school career with a win in a grand-finale game like this," he said. "The whole time I was playing, a smile wouldn't come off my face. "Both teams were filled with guys I know and have played with or against in school or AAU ball. This was a super atmosphere and when you add the great cause, it makes things even better." In the girls' game . . .
Ss. 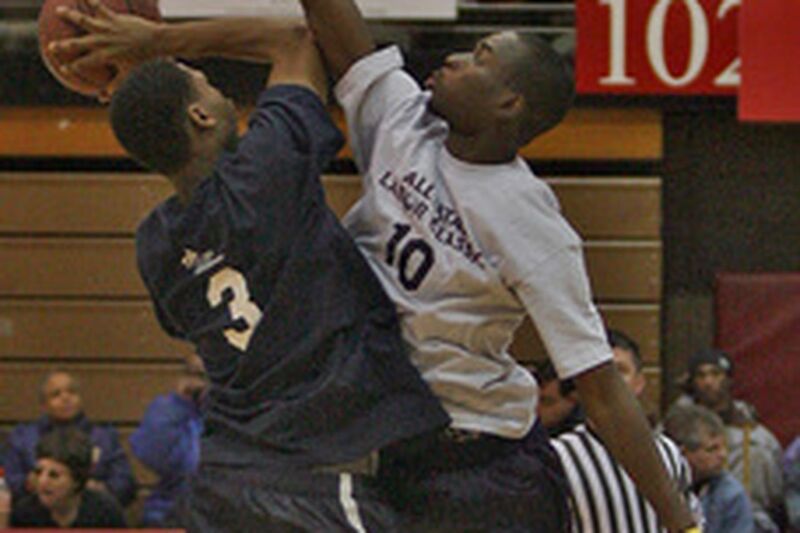 Neumann-Goretti has more than one lefthanded inside force bound for major college basketball. Rick Jackson (Syracuse), for one. Gloria Brown (North Carolina State), for two. Though City was skunked by Suburbs, 90-55, the 6-2 Brown fashioned a Jacksonlike performance with 15 points, 12 rebounds and three blocks. "Lots of people say I look like him as a player," Brown said. "Actually, my mom even told me that. I've known Rick a long time because we went to [South Philly's] Vare Middle School together. Back then, he was all chubby. He came so far. "When I was coming up, I always played against boys to try to get better. I see Rick in school all the time, but I haven't played against him since maybe the fifth or sixth grade." Before entering college, Brown hopes to expand her game and reduce her waistline. "I need to work on my jump shot, just a little, and I'm trying to get in better shape," she said. "I run around the track [at Temple]. I do sprints. I do suicides. I don't like it too much, but it has to be done. It will only be 'enjoyable' after I reach my goal and I can look back and know that all the work really did help me." Amberel Diaz, also of N-G, was the only other City player to score in double figures (11, 3-for-5 on treys). The Suburbs' leading scorer was Council Rock North's Addie Micir (14, 7-for-10), who is bound for Princeton. Her dad, Sylvester "Pancho" Micir, quarterbacked the old Bishop Egan to the 1966 Catholic and City football titles and was the Ivy League's leading passer for Penn in '70. Brown, meanwhile, was able to shake off the 35-point defeat in maybe 8 seconds.